I finished planting bulbs today, in the generic sense, meaning that I planted bulbs, corms and tubers for spring flowers. Some gardeners, both new and experienced, take great delight in correcting people who say they planted bulbs when they actually planted corms, like these crocus corms that I planted in the lawn out back. I planted 800 crocus corms which should result in a nice display for early spring. Those people who quibble about corms versus bulbs likely don't even know the difference between them. I learned it at some point because I probably had to know the answer for a test in college back in the day. Today, I have less need for that information. For the record, though, if you cut a true bulb in half, you'll find it has layers of what will be the leaves when it grows in the spring. If you cut a corm in half, you'll find fleshy stem tissue. Then there are tubers, which are like potatoes. 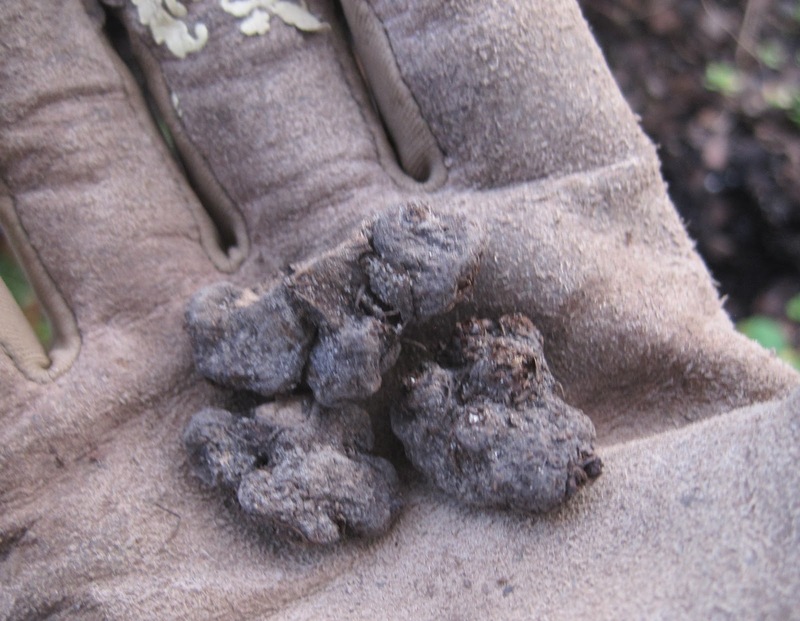 I planted these tubers today. These are Anemone blanda 'Charmer', also known as windflowers. This particular variety will be pink. 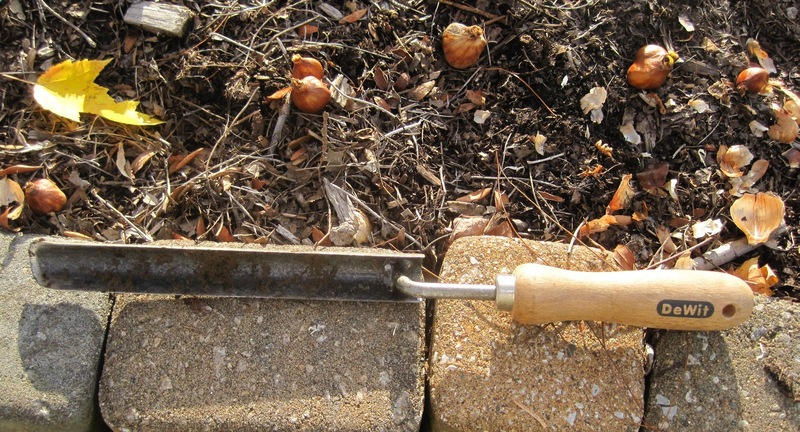 I also planted some true bulbs of daffodils, using this handy rockery trowel. When I bought the rockery trowel years ago, I had no idea what I would use it for, but it was a trowel I'd never seen so I got it anyway. I'm looking forward now to my spring flower display, a mix of old bulbs that should return and new bulbs just planted. By the way, if you felt a need to correct me just now for writing "a mix of old bulbs that should return and new bulbs just planted" and think I should have written "a mix of old bulbs, corms, and tubers, etc., then Dr. Hortfreud suggests that you have other issues to resolve, too. She thinks you probably also take great delight in telling people that a tomato is a fruit and not a vegetable. She thinks you should get over it and just go plant your own bulbs, in the generic sense, before it is too late. I have so many bulbs to plant but spent time helping my son;s Mother In law with my Grandson in toe,he loved it!!! I planted hundred of bulbs again this year. I don't do corms as the squirrels like these even better than tulips. Tubers are never a problem, no animal ever wants these. Looking forward to spring! Congrats on getting the planting done! I got my garlic in this week, but am still waiting on my flower bulbs. The darn companies haven't shipped them off yet. Don't they know winter is fast approaching? In all fairness, though, I did get my orders off later than I should have. Still, I thought my hyacinths at least would have gotten here by now. What a cool trowel. I bet it work wonders on the expletive-deleted maple roots I'm going to have to wrassle in a day or two. I'll be planting bulbs in the generic sense soon, too. Oooh, like Helen I am admiring that trowel and thanks for giving the link to the company. I will be checking that out. I am all for the generic bulbs to cover the whole range of those little bits that get planted into the ground with anticipation of the show they will provide in spring. Way to go! I use the term bulb loosely, too! > i don't care. I love seeing my crocus coming up through the snow. Thanks for the reminder!! I have two big bags of bulbs in the basement that I forgot to plant . DA! Ahh, Spring bulbs, my favourite! Can't wait to see yours bloom. Useful information and funny too. Although I knew that, I forgot. Thanks. Seriously? 800 corms? Wow. I'd buy you a plane ticket down here if you'd come plant 1/2 of that here! Can't wait to see that display. Whoa you've been busy I hope the faeries were helping! A very cool trowel indeed. Pay it Forward @ A Life Size Catholic Blog is up and running on a new schedule. I will post the first week of the month from here on out. This will accommodate my new crazy school schedule and allow us to continue to celebrate the best of the best on the Internet and in the blogosphere. The Linky is open now and until the 7th of November. I hope you will continue to share your blog posts with us. You have been such blessing in my life and the lives of other bloggers in our community! Thanks for the explanation of the differences between bulbs and corms and tubers, Carol. I just lump them all together, too, and say bulbs, especially since I usually don't remember what I ordered until I actually plant them. That rockery trowel looks pretty handy! Well, whether bulbs, corms, or tubers, I'm sure they're going to be beautiful when they come up! 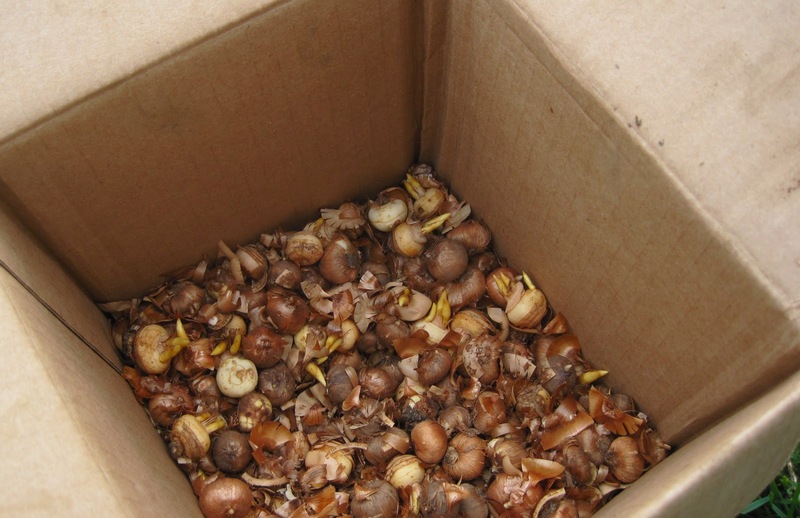 800 crocus 'bulbs' should make for an impressive display!